Delegate Shayla Jordan receives hugs after speaking in support of the One Church Plan and young adults during the 2019 United Methodist General Conference in St. Louis. Photo by Paul Jeffrey, UMNS. 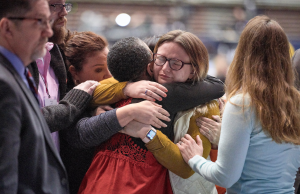 Some young United Methodists warn that the Traditional Plan – adopted February 26 during the denomination’s special General Conference – is the choice of older congregants who are not the future of the church. The plan retains a ban on gay marriage and forbids “self-avowed practicing homosexuals” from being ordained in The United Methodist Church. It also adds more accountability and penalties for those who defy the bans. The One Church Plan, which would have allowed such decisions to be made locally, was defeated. The Judicial Council, the denomination’s top court, will address questions about the constitutionality of parts of the Traditional Plan when it meets April 23-26 in Evanston, Illinois. Other young United Methodists took the passage of the Traditional Plan hard. During the February 23-26 special General Conference, 15,529 young people signed a statement asking for passage of the One Church Plan and for more young delegates to be selected in the future. “I think the hardest part is that we were not represented, and to know that my voice was completely overlooked,” said the Rev. Chrisie Reeves-Pendergrass, 31, an elder at Gilbert United Methodist Church in Gilbert, South Carolina. Shayla Jordan, a lay delegate from Great Plains, echoed that sentiment while speaking during General Conference. “People speaking here don’t represent the church that will be for years down the road,” Jordan said. Young LGBTQ people, especially those headed toward ministry careers in The United Methodist Church, are alarmed, some students said. “It’s a time of grieving right now,” said Kailie Hamilton, 19, who is studying social work and political science at the University of Kansas. “That our church that we have grown up in and loved did this to us; to us as queer people, to us as young people, to us as a generation, to us as a world, to every marginalized community out there.” Hamilton hasn’t decided whether to pursue a career in the church, but it is still an option she is considering. Kent A. Manzo, 22, a district youth president in the Mindanao Philippines Annual Conference, said he was “delighted” by passage of the Traditional Plan. 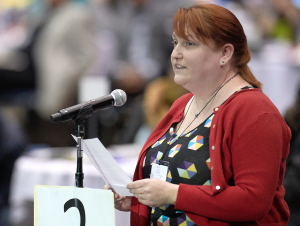 Aislinn Deviney, a delegate from the Rio Texas Conference, spoke about young adults and support for the Traditional Plan during the debate at the Special Session of the General Conference in St. Louis. Photo by Paul Jeffrey, UMNS. It was an online petition that was open to the entire world. There is no way to know how valid this petition was (and, in fact, anyone with even a slight knowledge of the internet and computers should have a healthy amount of skepticism about ANY online poll/petition). – a unique person (spoofing IP addresses and other ways to ‘hack’ petitions are well known). I believe the Traditional Plan is correct and Biblical. There are many other Biblical things that are difficult to understand in our ‘modern’ society but clearly Biblical. God created. . . Jesus was placed in a home with one man and one woman. . . Thank God for His love and grace! The fact that Chrisie Reeves-Pendergrass of Gilbert UMC in Gilbert SC feels her side is under-represented shows why our general conferences are out of balance towards the progressive side. Gilbert is in the middle of what is the most conservative county in the midlands of South Carolina, a very conservative state. The county is so conservative that Democrats often don’t challenge the Republican candidates and almost never win. Her church is 10 miles from the biggest UMC in the state, Mt Horeb, whose pastor is the state rep for the WCA . Mt Horeb planned to pull out of the church if the OCP won. I can guarantee that the majority of the congregation at Gilbert UMC do not share Rev. Reeves-Pendergrass’s views on gay ordination and marriage. Every conference elects more liberal delegates than they should if the laity voted alone on delegates. Our elders are far more liberal than the laity. If local pastors were allowed to serve as delegates and vote the situation would be more in line with the will of the laity. I wonder how long will locals be shut out when their numbers will soon far exceed those of elders?